Hi there, Tiffany’s daughter Hannah here. Even though I’m still a beginner at crochet, it’s been fun to realize how much I can experiment with different designs and colors while still using simple stitches. 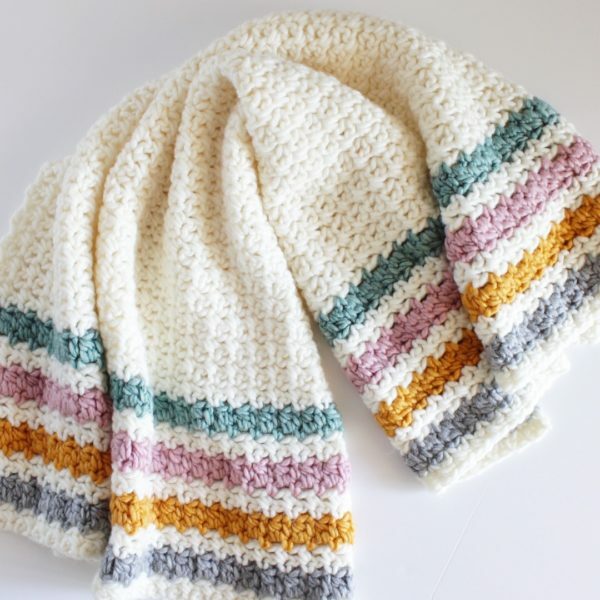 I found this beautiful buttercream yarn at JoAnn’s a few weeks ago and I loved the colors and knew I wanted to make a blanket with them, but I wasn’t sure how to put them together. 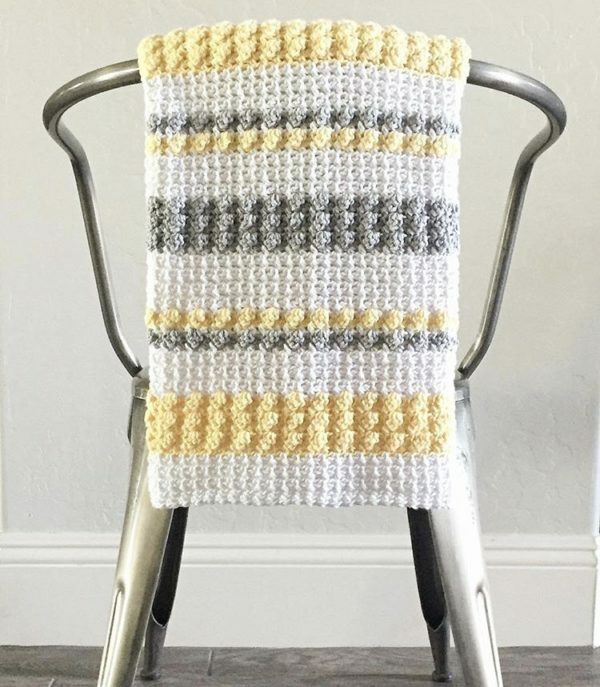 Then I recently saw a blanket at Anthropologie that used these colors and had big white tassels on the ends and I decided to just alternate blocks of color using the very beginner-friendly mesh stitch. Since the Buttercream yarn is alpaca solid, it’s a little hairy to work with, but the yarn is so so soft and the colors are so lush that I think it’s worth it. I was planning to give the Diamond Berry Stitch Blanket to my new niece that is scheduled to arrive in August, but this yarn is just so soft and squishy compared to the wool blend I used for the diamond blanket that I might give her this one instead :). Finished blanket appx. 33in. x 40 in. (You can purchase an ad-free PDF of this pattern from Etsy. Free pattern below.). Start with an even number of chains. (For this blanket, I chained 80). SC in the 2nd chain from the hook. CH 1 and skip the next chain. SC into the next CH space, then chain one. Skip the next chain continue the pattern of SC, CH 1, SK 1 all the way across. That’s all you need to know to work the mesh stitch! Take the pieces of yarn and fold them in half. Insert the folded end into the chain space above the starting chain. You can either do this just with your fingers or with a large hook – whichever is easier for you.